That means Anni and I usually pick a stamp or stamp set or die that we both have (we nearly have the same taste!) and create a card with this product and another task. I am in love with crackling paint right now - I could use it on ton's of cards. Passing it through a stencil with a gradient distress-blended pattern woul look cool was what I thought. And for the German sentiment saying "Friends like you are priceless" I wanted to make one of the birds stand out - that's why I colored the others in warm grey tones. Stamp the birds, color and funzzy cut them. blend Distress Inks in Cracked Pistachio and Twisted Citron trough a stencil. Keep the stencil in place and add crackling paint. Let it dry or (carefully!) dry it with your heat gun. Stamp the sentiment in Versafine Onyx Black Ink. Add the birds using foamsquares - this makes them stand out. use matching embossing powder on some wood veneer stars to embellish your card. ad a strip of washi to finish off the card. 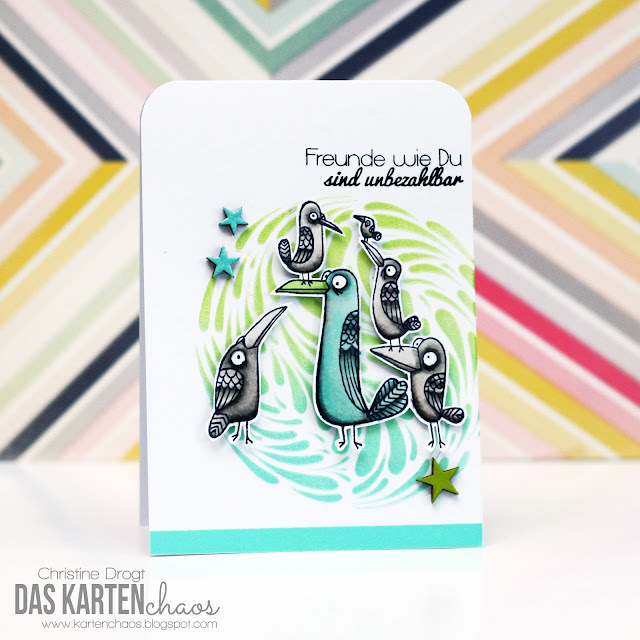 Crackling Paint adds a lot of texture to your card - keep the rest of your card simple to make the crackles shine. embossing powder is a great way to make your embellishments match your project. Make your sentiments and images say the same. This pulls your card together. This is beautiful!! I love the colors that you used on this!! Eeeeeeeek!!! That's sooooo cute! Love those birds!!!! ❤️ Love that background! Amazing!! How cute are those birds?! Fun cards!! This is totally wonderful and amazing! I just love it!!! Ich LIEBE diese Karte! Wie verrückt! Und die Vögel! und die Farben! Echt!!!! ICh krieg mich kaum ein... ich liebe diese Farben!!!! ich wünschte ich kann mal mehr als nur Pink zaubern!!! 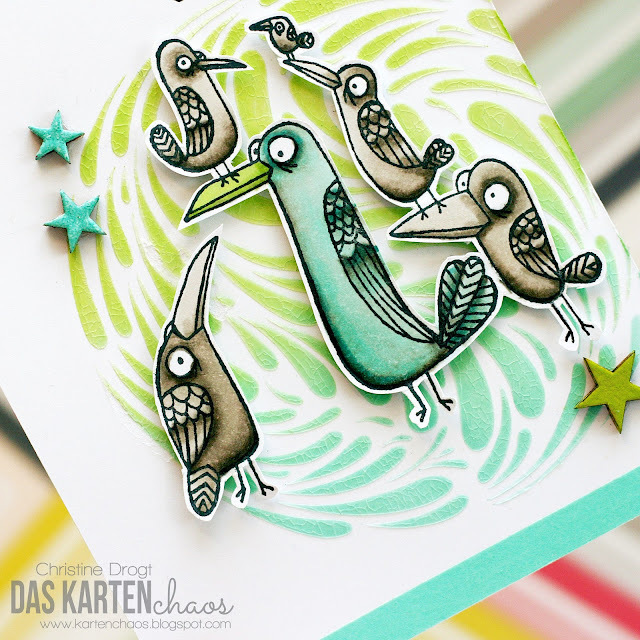 What a pretty card.... as pretty as can be with nutty-looking birds. I love, love, love that stencil you used. Haven't seen anything like it in USA. I also love the bird set. Your tips are wonderful, and your technique is fantastic. Layout, color combo are hits with me and you've done it so creatively.